VERY OLD, SLOW and OBSOLETE! 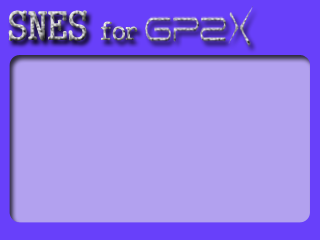 The very first SNES Emulator for the gp2x. Still a bit slow, but it's working. Already included is a small GUI. You can download background themes for the GUI here. You'll need the SDL Libraries installed. What extension do the roms need to be? Mine are .swc, and are not recognized by the emulator. Yeah, anyone knows how to save and load a game? where do i go to read all the comments? my screen only shows 4 but there seems to be 12....ca any1 help? does anyone know how to import game saves from my PC SNES emultator(ZNSES)??? I've only tried one game on it so far, and most of the time there is no sound, and the speed is good, but it crashes randomly after only a little while. On the other hand, it will sometimes have sound but run slower, Interestingly enough it will not crash on these occasions. So I'm wondering if there is a way to disable sound. in order to increase stability (for now). i can't get it to work :( i,ve installed everything and it still won't work. wtf should i do? please include source, or at least build scripts/ any other modifications to mainline source. or at least include your contact info so people can request it as per the license. cheers. Yes! please include the source, the engine runs rather quickly and doesn't have clipping problems. You and Squidge should work together, perfect combination I say :D, your webpage really doesn't help either. Even if you don't wish to continue the project, might be nice to let others work on it, it shouldn't go to waste not being updated. You know, I have to say we need both the SNES9x and SquigeSNES, just like we've got ZSNES and SNES9x for the PC! I alternate with both on the PC, and I seem to be doing the same on my GP2x! >_< But great job to both of them!